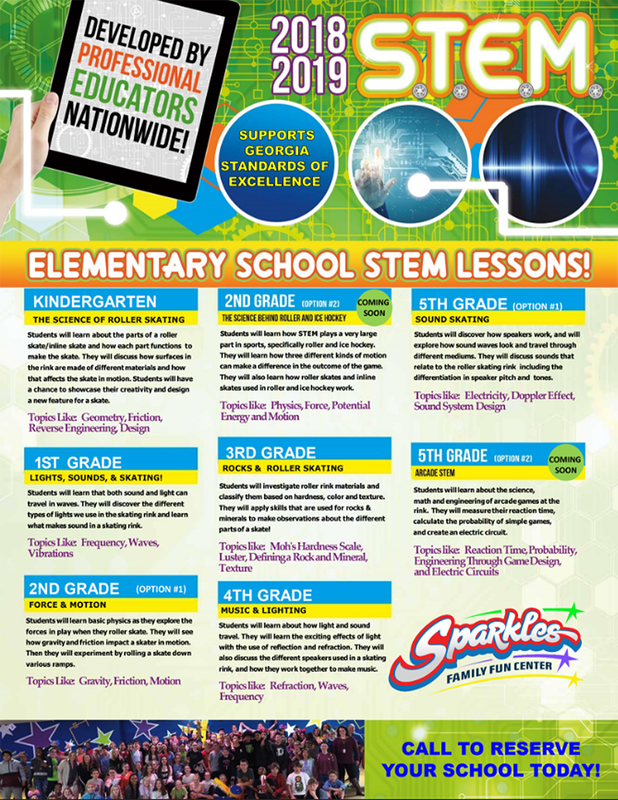 Sparkles of Smyrna has a STEM Field Trip program that is interactive, engaging, and designed with each grade level in mind. We offer hands on learning that excites kids of all ages. 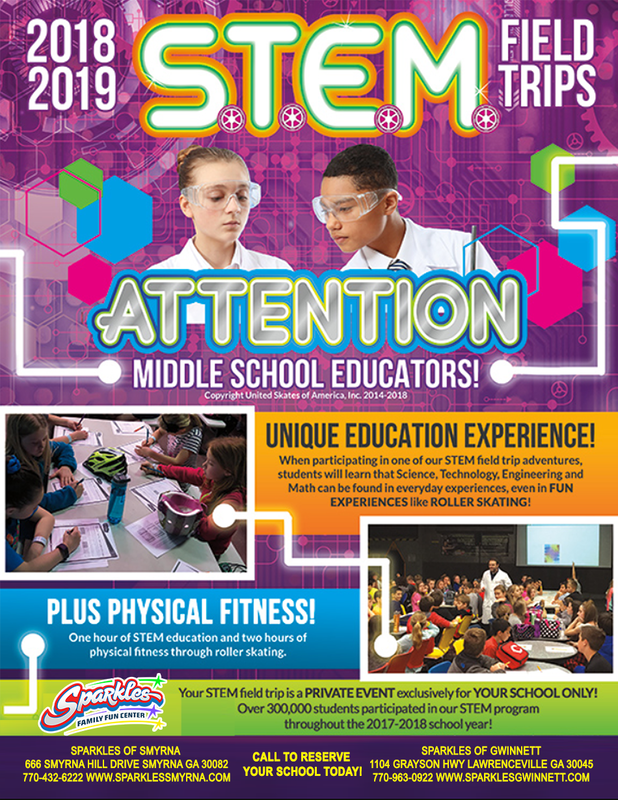 Our STEM field trip combines classroom concepts with real word examples, and meets the Next Generation Science Standards which are setting the bar for elementary science education along with the Common Core Math Standards. Every one of our 5 great lessons directly relates to what students are studying in the classroom, bringing the textbook to life. Our program motivates both students and teachers to have an energized, fresh view of STEM education, Roller Skating and Lessons allowing students a time frame to skate and enjoy physical activity. In closing we invite you to take a look at the attachments provided. We still have select dates available for the remainder of this school year and are taking early reservations. Please feel free to contact our office Monday through Friday, 10am until 5pm for booking or more information. We look forward to speaking with you and working with you and your students this year! 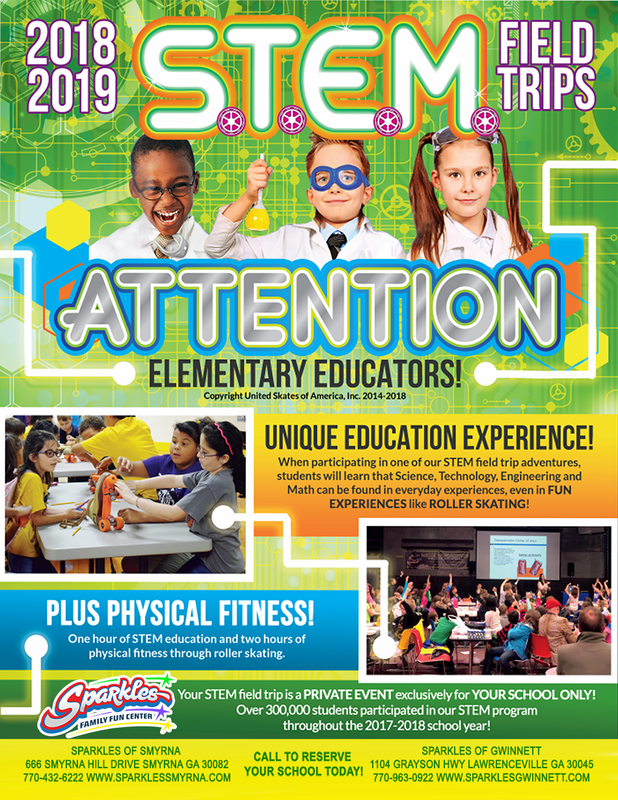 Book your School STEM field trip now by calling our Group Events Planner at (770) 432-6222 for group event pricing and availability. $9.00 per student includes Skating and Playground if optional, Students bring their own lunch. $10.00 per student includes Skating, Playground, and Lunch at Sparkles (1 slice of cheese pizza and 8oz soda). $15.00 per student includes Skating, Playground, and Lunch at Sparkles ( 1 hour lunch time with unlimited pizza and soda). YOU PICK THE LESSON! 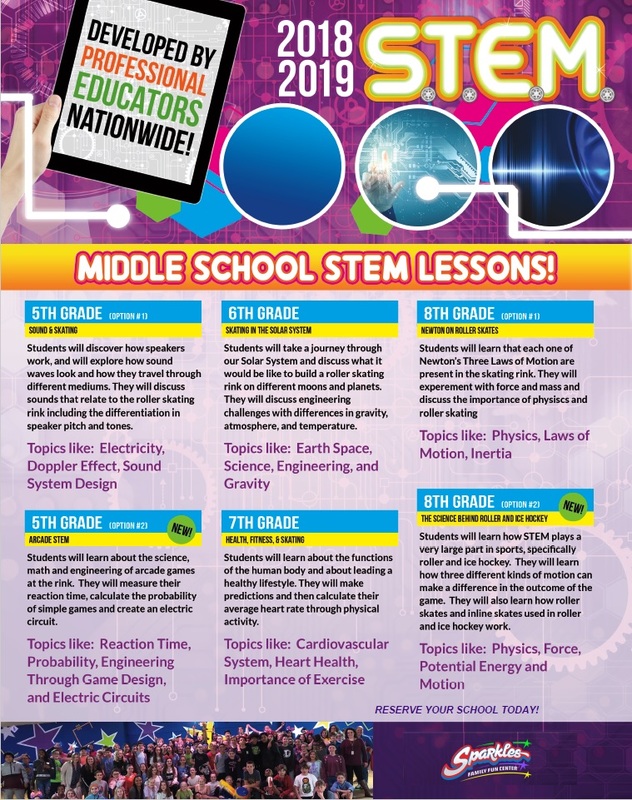 We have multiple lessons available from Kindergarten to 8th grade and one lesson specifically designed for 9th – 12th grade. Teachers and parents can skate for FREE. This program is available Monday – Friday morning and afternoon.